Finally, The Acer Predator Gaming Line Is Now In The Philippines! 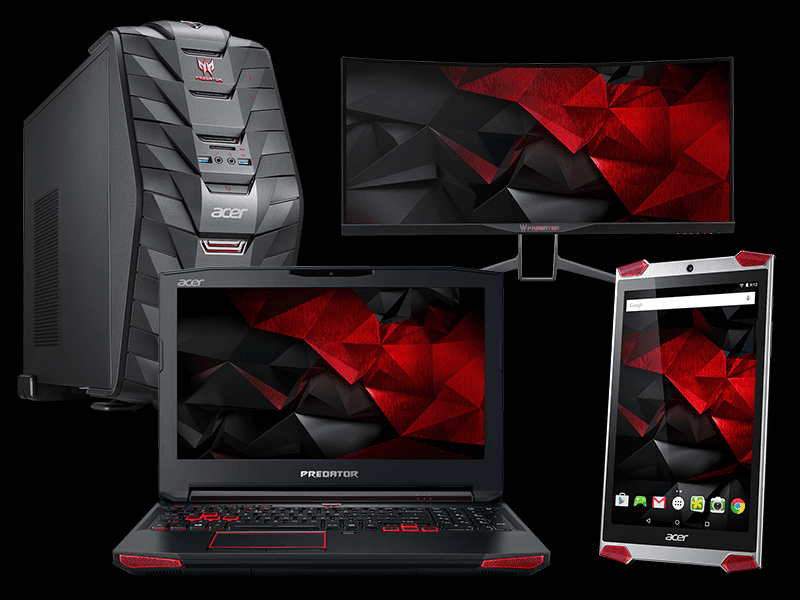 Home / acer / news / pc / Finally, The Acer Predator Gaming Line Is Now In The Philippines! First introduced last year, Acer's first gaming line dubbed as "Predator" truly captured our attention. They're awesome looking, well machined, packed with beastly configurations, and paired with great price for its class. The Predator line is designed to unleash the gamer in you by letting you run the heaviest game around without the worry of annoying lags, heating, dangers of keyboard bashing, and etc. It aims to let you focus on doing your best on every quest or battle you face in order to succeed. Acer Predator's line includes gaming PC, laptop, tablets, monitors, and projectors. Those devices includes the Predator 15 laptop, Predator G3 PC, Predator 8 tablet, Predator X34 monitor, and Predator Projector. First in line is the Predator 15, its the younger brother of the Godly Predator 17 that's not an infant in terms of performance. First reported last month, the Predator 15 is also a monster for its class. It's equipped with a large 15.6 inch matte full HD panel, 2.6 GHz 6th gen Intel Core i7-6700HQ HM170, 3 GB Nvidia GeForce GTX 970M, 6 GB expandable up to 32 GB, and 8 cells 90 Watts battery. There's also a two color backlit keyboard, two speakers and one subwoofer, Predator FrostCore fan. It retails with an SRP of 69,990 Pesos. Their PC offering on the other hand is the Predator G3, a gaming machine that features beautiful dark amor looking design, the latest Intel 6 gen core processor, latest NVIDIA GeForce GTX graphic cards, and IceTunnel cooling system. It's designed to give you top notch performance that enables you to play even the heaviest games around seamlessly. The Predator G3 is priced at 59,999 Pesos. Then there goes the Predator 8 for those who seeks a fancy looking gaming tablet that anyone can carry on the go. It boast a beautiful 8 inch screen, 1.6 GHz Intel Atom x7-Z8700 quad core processor, great type of Intel HD graphics, 4,420 mAh, and run on Android 5.1 Lollipop OS. This gaming tablet also features the Acer Quadio taht has 4 front facing speakers on the corners. From its first announced SRP of almost 18K, the excellent Predator 8 can now be purchased at just 12,990 Pesos. Acer also introduced a rare type of monitor, a gaming monitor in particular. Dubbed as the Predator X34, it is a HUGE 34 inch curved IPS monitor that boast a 21:9 ratio. It features a refresh rate of 100 Hz for accurate details, Acer GameView OSD settings, their patented EyeProtect feature, and two LOUD 7 watts DTS ready speakers. The Predator X34 gaming monitor retails at 64,990 Pesos. Last is the Predator Projector, yes this is a gaming projector. It beams a 100 inch super clear screen for as close as 1.5 meters, has Full HD 1080p resolution of 1920 x 1080 pixels, ColorPurity tech for color gamuts, 10W DTS ready speakers, and NVIDIA 3DTV display to give an immersive experience that improves your gaming on a much bigger view. This gaming projector has a price tag of 78,990 Pesos. Acer's powerful Predator line can be purchased at PC Express Gilmore, the Villman Computers Philippines at SM North EDSA and Octagon Computer Superstore at SM Megamall. For more info, the FB page of Predator Philippines is now up.